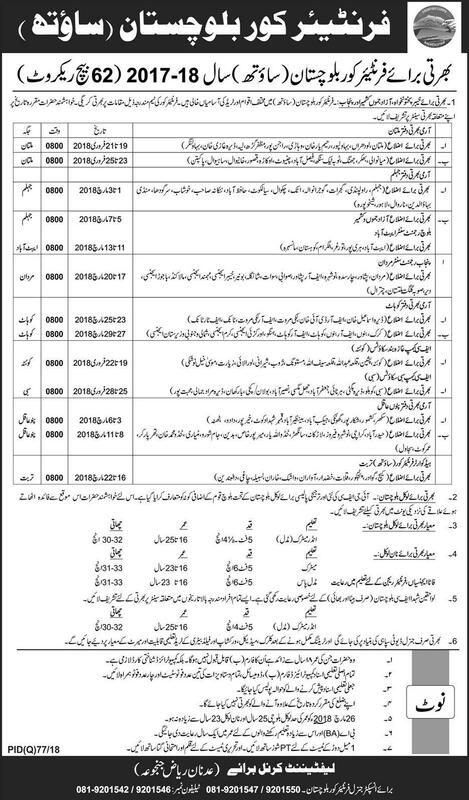 Government of Baluchistan Jobs 2018 in Frontier Core Baluchistan (South). Be a part of Pakistani Forces by joining Frontier Core Baluchistan. These jobs are announced in Daily Express Newspaper 11th February 2018. Recruitment process is open at following Districts/Zones Multan, Jhelum, Abbottabad, Mardan, Kohat, Quetta, Sibbi, Pannu Aqil and Turbat. These jobs are for Khyber Pakhtunkhwa, Azad Jammu & Kashmir, Baluchistan and Punjab Province Only. The Successful Candidates will Be given any rank after completion of training on Performance, Education and Experience basis. Domicile Required Azad Jammu & Kashmir, Baluchistan, Khyber Pakhtunkhwa, and Punjab.